Practicality: Choosing a reliable & accurate rifle for your 1st and 2nd Airsoft Rifles. So today's blog will be focusing on the theme of Practicality, a concept that doesn't get a whole lot of lovin' in the Airsoft world. I've said it before, but I would say that the majority of us got into Airsoft because we saw how cool the guns and gear looked and instantly fell in love with the glamour of it all. However, the cold cruel reality is that there are certain models or types of guns that are just not practical choices when you're choosing your first Airsoft gun. There are multiple reasons for this. For example, I would generally would not recommend a Gas Blowback Rifle (GBBR) for someone who is brand new to Airsoft and/or shooting guns, real or Airsoft. GBBRs are much more high-maintenance than AEGs, in my experience, and most models use a very low-capacity magazine to enhance the realism factor. I've found that most beginners, should go with a higher capacity magazine to start off with while they develop their shooting skills. Additional consideration when choosing your first two rifles should be given to durability and skirmishable accuracy (can the rifle hit a torso-sized target at 50 yards, assuming the gun is shooting between 350 to 400 fps with a .20g and the shooter has enough natural ability to figure out how to aim the rifle at his/her intended target). Chances are, if you're new to Airsoft, you have no real business trying to take your gun apart for repairs or upgrades yet. So you're going to need a gun that you can use that can stand some abuse and has a generally good reputation for not breaking down. Again, since you really should leave your gun's internals alone for awhile, until you can do some proper research, so you'll need a gun with decent accuracy (read: a well-made hop-up unit). With those criteria in mind, here are a few recommendations from me to all the noobz out there, looking for which gun to get. This is not an all-inclusive list, but should do you just fine. M14s, arguably the most well-designed hop-ups out there. Echo1 makes a very nice clone of the Tokyo Marui M14, and matches their hop-up design pretty well. Classic Army M14s use a different hop-up design, but it is still better than most others I've seen, PLUS their M14 gearboxes are very beefy and make excellent platforms for heavily upgrading the rifle to a high-powered Designated Marksman Rifle (DMR). Their gearboxes, while not made to Marui-spec, still fit a wide variety of after-market upgrade & replacement parts. 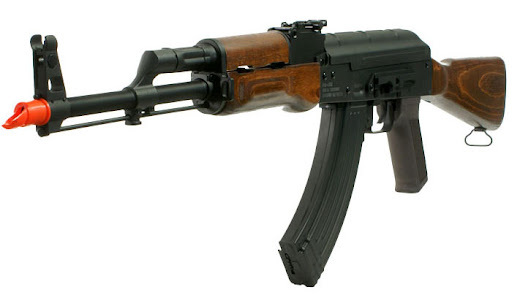 AK47s: Generally consistent hop-ups and lots of accessories to geek out your gun with. Remember, there's nothing wrong with going native. M249s, M60s, M240 Bravo & RPKs: No Airsoft arsenal is complete without an Airsoft light machine gun for the support weapon role. Generally speaking, their gearboxes are easy to access for repairing stripped pistons & replacing springs. Hop-ups are usually decent in most brands and are great for setting yourself apart on the field with a standout gun. The Echo1 M240 Bravo is so good that I haven't needed to adjust it ONCE in 2 years or so of running it hard. I'm not kidding. It's probably the best Airsoft guns right out of the box currently available on the market. Top 10, AT LEAST. Plus, if you're playing at a field that only allows support weapons to fire on full-auto while all other gun-types must fire on semi, you will be a very popular fellow when it comes time to pick teams. 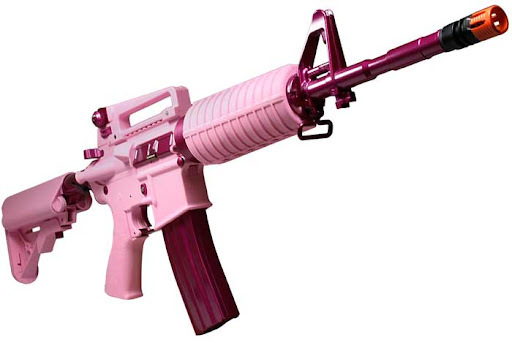 M4s: I'm including this option in here NOT because they have great hop-ups or anything, since they actually have some of the worst-designed of all the different AEG gun-types out there. However, I am including M4s because they are in heavy abundance at just about every field you will attend. Therefore, if you are ever in need of an extra mag or spare battery, chances are, someone at the field will have one that will work with your gun to get you through the day. Additionally, they have perhaps the most internal parts and external accessories available on the market for tuning and tweaking your gun out to the max, when the time comes to get into that sort of thing. You might have noticed that in the title of today's blog, I mentioned "2nd" rifles as well. I am referring to your backup rifle that you need to have with you at all games in the event your 1st rifle breaks down. At some point, it will break. I promise. It might not break right away, but just be patient and enjoy it while it works. But, when it does break, if you have a backup rifle ready to go, your day does not have to end there. You can simply go back to your car, grab the backup and get back into the game. This backup rifle should not be some exotic rifle with limited replacement parts or a bad hop-up either. Use the same criteria I mentioned above to select your backup rifle. It doesn't have to be the same exact make and model of your 1st rifle, but it also wouldn't hurt either. If you're on a budget and don't want to have to buy all new mags and then load those mags in the middle of a game, then simply buying two of the same rifle would be the way to go. Granted, you can circumvent the mag-loading issue by simply loading ALL your mags the night before, but if you're like me, sometimes that step gets overlooked in the midst of all the other items that need to be prepped the night before as well. The criteria for selecting a solid GBB Pistol to use as your sidearm is pretty much the same, but I'll get into that on another day.